This trip is currently available to men only. Waitlist applications are being accepted for women. Sail with us to Italy, Spain and Monaco this summer! From exploring sun-drenched coastlines to sampling local delicacies; and discovering architectural marvels to viewing artistic masterpieces, a Mediterranean vacation will take you far from the ordinary! Our home-away-from-home for this 9-night adventure is on Celebrity Cruises brand new ship, Edge. With her maiden voyage in December 2018, this long-awaited ship has so much to look forward to! From the three-story Grand Plaza inspired by the piazzas of Italy to the world-class performances that bring you the best entertainment at sea, you will be delighted at every turn. The Spa on Celebrity Edge is the unparalleled escape you deserve and a visit to Eden, a space where nature is so present it is called “a room that lives”, you won’t find anything else like it at sea. On Edge‘s Magic Carpet, the world’s first cantilevered, floating platform that reaches heights of 13 stories above sea level, you can soar over the open ocean. With breathtaking views, a full bar and space for live music performances, it truly is a destination itself. And to make your vacation as hassle-free as possible, we have bundled everything together, so the price you see is the price you pay. The rates on our Pricing tab include all taxes, fees and gratuities (valued at over $220), a beverage package for those in Ocean View staterooms and higher (valued at $550, limited time offer, subject to availability) and much more. Plus, our own brand of amazing cruising with group activities and events, personalized shore excursions, onboard group travel coordinators and more. With all of these additions, our cruise is virtually all-inclusive! Add to all this a great group of Jewish singles and your Mediterranean Cruise will be a vacation that will change your life! We hope you’ll join us for an amazing summer vacation. 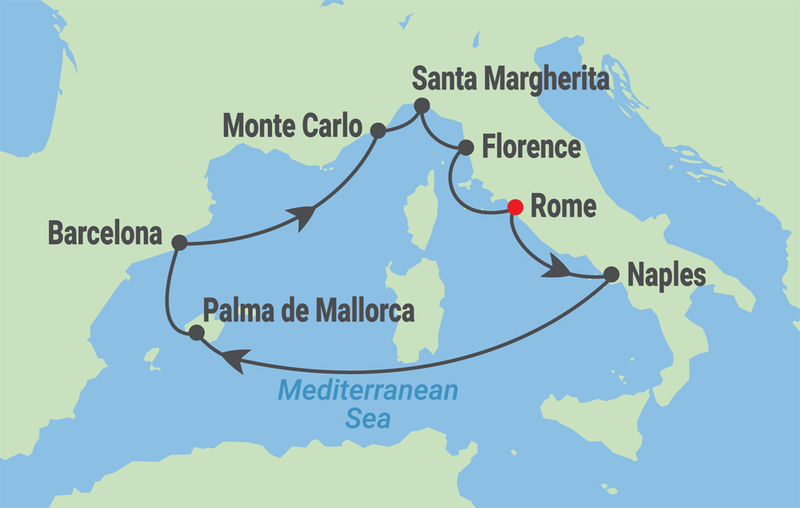 Click here to see a preview video of the Mediterranean Cruise! Embark Celebrity Edge, depart at 5 pm – Our cruise to the beautiful Mediterranean and your Amazing Journey begins today! Get to know your fellow traveling companions as we gather poolside for a sailaway celebration, followed by our Welcome Aboard program and group ice breaker. A group dinner onboard the beautiful Celebrity Edge will follow. Arrive at 7 am, depart at 9 pm – Located on the southern coast of Italy, Naples has spectacular scenery that attracts artists from around the world. Taste one of Naples’ greatest contributions to western civilization – pizza – invented to honor the Queen of Italy in 1889. From Naples, it’s an easy journey to visit other much loved destinations including the Isle of Capri, the ancient ruins of Pompeii or Sorrento and the Amalfi Coast. Cruising – Today you’ll get to enjoy all you came on a cruise to do… relax poolside with your new friends while sipping a daiquiri, try your luck in the casino or enjoy the spa. Plus, we’ll have some group activities to make your day even more enjoyable. Enjoy a drink on Edge‘s Magic Carpet, the world’s first cantilevered, floating platform that reaches heights of 13 stories above sea level, you can soar over the open ocean. Our day at sea will provide lots of opportunities for great times on our floating resort. Tonight, we’ll come together for an Amazing Journeys cocktail party, followed by an amazing show in the theater and late night dancing. Arrive at 8 am, depart at 6 pm – The ‘pearl of the Mediterranean’ is a beautiful island off the coast of Spain where the Mediterranean flair can be felt in every corner. A former Moorish casbah, or walled city, Palma’s Old Town is an appealing maze of narrow streets that are a delight to explore. Wander in any direction from the awe-inspiring Gothic Cathedral at its geographic and historical heart and you’ll find medieval streets lined with aristocratic townhouses, looming baroque churches, teeming public squares, vibrant bohemian neighborhoods and markets overflowing with all the bounty of the island. Arrive at 9 am, depart at 9 pm – Barcelona is a city like no other. The amazing architecture here is a bit like falling through the looking glass. From Gaudí’s Sagrada Familia to Park Güell, you’ll be amazed. 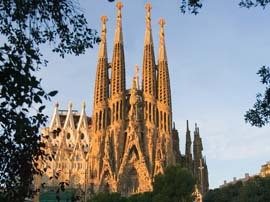 Walk along Las Ramblas, the most famous street of Barcelona and taste a bit of Spain in the open air market, Boqueria, sip sangria at a sidewalk café while watching flamboyant street performers, explore the area of Port Vell, then create your own moveable feast by floating from tapas bar to tapas bar. Visit the squares and architecture that have made Barcelona so famous. Cruising – Our day at sea will provide lots of opportunities for group fun. Enjoy a massage at the spa, participate in wine tasting or yoga – the day is yours to recharge. Visit Eden onboard, a space on the ship where nature is so present it is called “a room that lives.” Later, join us for Jacuzz-a-Palooza with some pretty amazing friends. Arrive at 7 am, depart at 8 pm – Steeped in 700 years of Grimaldi royal history, Monte-Carlo’s location is stunning, tucked between French medieval villages and the Alps. With luxurious palaces, an over-the-top casino, breathtaking beaches, fancy cars and gardens fit for a princess, the Municipality of Monaco will keep you searching for your prince. The nearby village of Eze is worth a visit as well with its cobblestone streets and quaint ambiance. Arrive at 8 am, depart at 5 pm – Located in the middle of the Italian Riviera, life in Santa Margherita centers around the palm tree surrounded harbor where boating and simple sunning are the orders of the day. 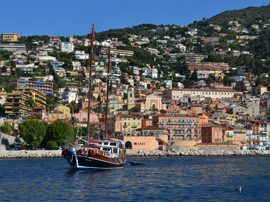 Spend time in this beautiful area or take a trip to Portofino or Cinque Terre where you can walk through the colorful villages and take stunning pictures of this iconic seaside town. Arrive at 7 am, depart at 7 pm – The port city is surrounded by spectacular Tuscan scenery. Set off from here to explore Florence – the birthplace of the Italian Renaissance and home to world-class art galleries, museums and dining. Take in the architectural wonder of The Duomo or sneak in some shopping at the San Lorenzo Market Stalls. If you’ve already visited Florence, head to nearby Pisa to see its famous bell tower, or enjoy a hike through the lovely villages of the countryside. Arrive at 5 am – Our cruise ends here. You’ll take home memories of amazing sites and scenes from the Mediterranean, plus friendships to last a lifetime. A deposit of $550 ($1100 for single occupancy) is due with your reservation. Final payment is due on May 1, 2019. Cancellation Policy for Cruise and Pre-Cruise Packages: Prior to February 5, 2019, there is a $100 penalty for cancellation. From February 6 – April 30, 2019, the cancellation penalty is the amount of the deposit for the cruise and pre-cruise package. From May 1 – June 18, 2019, the cancellation penalty is 50% of the total for the cruise and pre-cruise package. 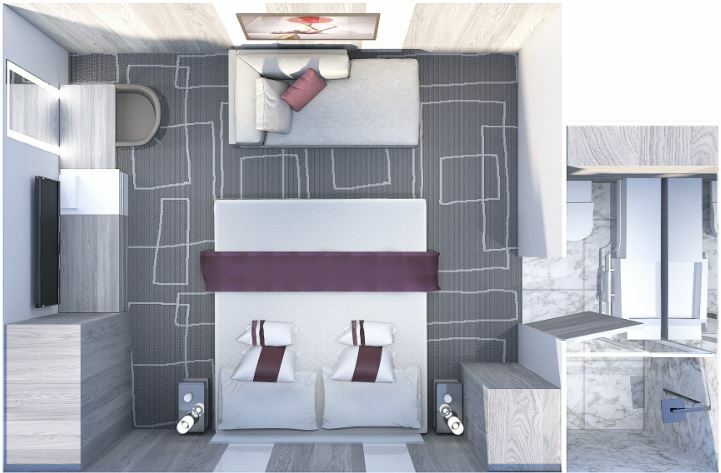 From June 19 – July 1, 2019, the cancellation penalty is 75% of the total for the cruise and pre-cruise package. Cancellations made on July 2, 2019 or after and “no-shows” will receive no refund. There is no refund in the event of interruption or cancellation after the start of the cruise and pre-cruise. Proof of Citizenship: All passengers must present a valid passport (valid for six months beyond the last date of travel) to board the vessel. There is no visa required for US, Canadian or UK Citizens to all of the countries we are visiting. If you are from a country other than those mentioned, please check with the Embassies of Italy, Spain, & Monaco to find out if a visa is necessary. Port Taxes, Fuel Surcharges, Government Fees and Gratuities: Port taxes, government fees and gratuities have all been included in the rate. Port taxes, government fees and gratuities are subject to change. Should oil costs go above $65 per barrel, and the cruise line adds fees, Amazing Journeys reserves the right to add them to the cost of the package. The cost will be no more than $10 per guest per day. Air and Airport Transfers: Airfare has not been included in the cruise rates. Information on optional transfers to and from the ship will be sent closer to the sailing date. It is important that you not purchase airfare until you receive a confirmation letter which will contain specific flight parameters. 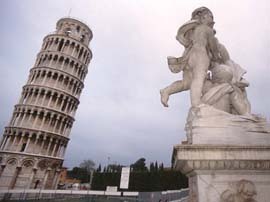 Cruise and Pre-Cruise passengers will fly round-trip to Rome (FCO). This cruise is operated by Celebrity Cruises. The pre-cruise is operated by Unico.